Here are my Stars of the Week–aka favorite posts and tweets! 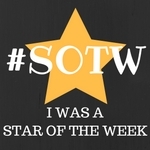 If you’re a #SOTW, grab the badge using the code below if you’d like it for your blog! Remember you can always use the nomination form and I will put it in my next post! Let’s start with a super happy post from Elissa (@misscalcul8). Sometimes it’s nice to reminded that, yes, this job can sometime rock. And it couldn’t be rocking for a nicer person! I bet making lessons like these is definitely helping the positive trend! E (@cheesemonkeysf) is a pro at turning everything into a good set of Talking Points. Her newest one has the theme of (loosely translated): Keep Calm and Carry On; You Can Do This. Pam (@pamjwilson) has a easy way of getting students to slow down and think about graphs. If you need some logic games, make sure you visit Julie’s (@fractionfanatic) blog. So many good ones that are new to me! I found Math PD for Substitute Teachers fascinating, both the idea of having PD for that and what Allison (@allison_krasnow) chose to do for it. Scroll, scroll, scroll and you will see the most genius idea ever from Jennifer (@MrsCookKHS): ZIP TIE PENCIL POUCHES TO DESKS. I feel like it is so genius that everyone must already know it but me. Trying to get back onto the Blaugust bandwagon! Man, does school ever take it out of you or what?!? Did I mention that I was given no curriculum. No workbooks. No website. No books. No idea what I’m doing. (ugh, gdoc file here. I’m sorry.) (Thanks to Chris Haren for letting me know I had the complete wrong description for 75th percentile. It is now fixed in the pic & in the file!) 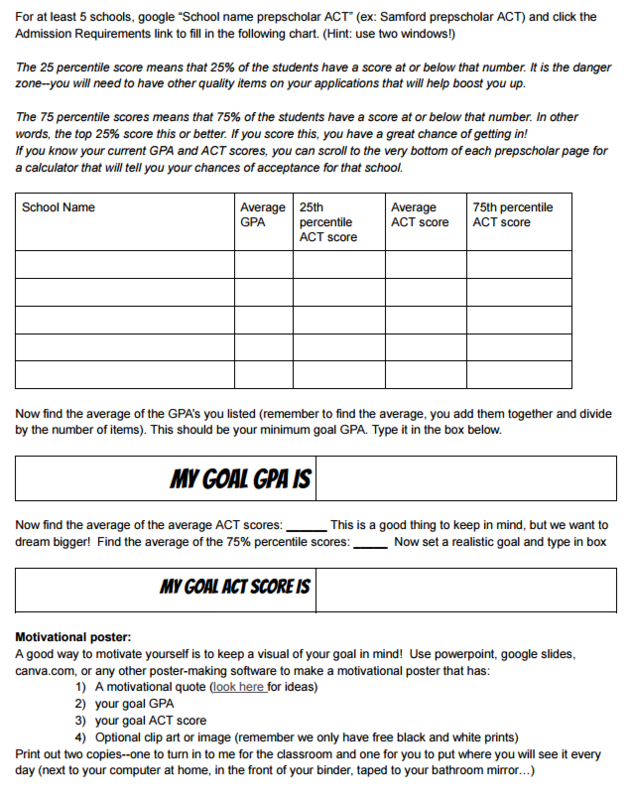 The neat thing is they have a page for each college with GPA, SAT, and ACT scores-just google “schoolname prepscholar ACT.” And if you scroll to the bottom of the prepscholar page, it even has a little calculator that tells you your chances of getting in. For example, here’s my alma mater: Samford University. It’s also fun when a student mishears it (as many people do) and we end up comparing it to Stanford University. After the students got scores from five colleges, they figured out their goal scores. I then had them make a motivational poster with their goal GPA and ACT score to hang in the classroom because who doesn’t like a motivational poster, amirite? I know most of y’all are not teaching ACT, but I thought it might be a good thing to file away for an emergency sub plan, weird scheduling day, or when you just can’t even. It’s that time again! Here are my Stars of the Week–aka favorite posts and tweets! If you’re a #SOTW, grab the badge using the code below if you’d like it for your blog! In case you haven’t noticed, I need to branch out more in my reading-I have “only” about 100 math blogs in my reader. My goal is to start clicking on some unknown blogs using @MTBoS_Blogbot, but of course I can’t read everything that’s out there! So if you’d like to nominate a post, you can either post on your own blog OR use this handy nomination form and I will put it in my next post! Greta, @g_brgmn, is someone I want to hang out with more. I love her idea about using the “math about me” numbers later in the year to make kids think she has mind-reading powers! And then she confessed that she’s a font/quote lover like me! Seriously, have I mentioned how brilliant Dave (@Dave_Sabol) is for starting the “How I Teach” series? Reading Anna’s (@TypeAMathLand) answers makes me want to go back and change mine because hers were so darn good! Man, Sara Vaughn (@Vaughn_trapped) knocked the wind out of my sails with this post about being intentional. I’ve totally used up my share of miracles, too, Sara. Thanks for being so honest and giving me a much-needed wake-up call! Two Saras this week! Love the 10 Things Not to Ask Me about Your Calculator from Sara Van Der Werf (@saravdwerf). I’m thinking I need to make one for Google Classroom! Glenn (@gwaddellnvhs) is going to be so happy that he’s won TWO #SOTW! My goal this year is to find where I’m supposed to be. Speaking of which, I probably would have starred Desmos’s (@desmos) post announcing their first cohort of Desmos fellows even if my name wasn’t on there. So many MTBoSers! So many rock stars! Beth (@algebrasfriend) makes me want to DO ALL THE LABS for function exploration. Hey, wait a second…I do have this problem solving course with no set curriculum. That means I get to DO ALL THE LABS!! Hey, are you following @SheaSerrano on twitter? He’s totally not-math-related but his tweets always make me happy. If you want to be happy as well, you should read his post (“article”) about the US Gymnastics team. You know what else you probably don’t deserve? The best damn news story I’ve read in a while. But you may have had a long week and maybe have the Sunday Stinkies/Monday Moanings, so you probably deserve some of my favorite tweets! Me: you have your x and y axes backwards. S: but it’s rise and then run! S: so you’re changing it this year? Every time a kid makes a mistake that leads to a cool learning moment, I add a point to the “Great Mistakes” board. This is a GREAT cheatsheet for first-time twitter chatters! Sorry for the delay! I’m going ahead and making my post for the week, even though I still have 60+ posts to read in my reader. You’ll just have to stay tuned to see if there were any stars in those! And for those of you that are SOTW, feel free to use the code below to grab the badge! Glenn (@gwaddellnvhs) has achieved his goal of writing a post that was #SOTW-worthy with this awesome collection of MTBoS stuff. BOOKMARK IT NOW to send it to that teacher you meet who hasn’t heard of the MTBoS (or for when you think “who did that thing…?”). I even made a bitly for you: bit.ly/mtbosresources You’re welcome. Casey (@cmmteach) has been knocking it out of the park with her MTBoS ABC’s. Maybe it’s back-to-school emotions, but her B post made me tear up a little. Math by the Mountain, WHO ARE YOU?!? I mean, I know you’re @MathByTheMt, but WHO ARE YOU!?! I love her/his (but the font choice makes me want to say her?) justification posters! Wouldn’t it be great to have a wall covered at the end of the year with all the cool stuff you learn in Geometry? And if you’re an exit slip type of person (or want to be) then this Exit Slip Extravaganza is for you! So I think maybe I should rename Stars-of-the-week to Sara-of-the-week! This week Sara (@saravdwerf) has updated her math wall of shame and posted a very cool visual for units. I love her visual course-at-a-glance at the bottom of that post. That would be so much more beneficial than a boring ol’ syllabus or table of contents! Hey, let’s give Ali (@AGEiland) a big high-five as she blogs her first week as a teacher! I’d say she picked two very good words. And to book end Ali’s blog, here’s a great list of 13 Things I Was (and Right) About in My First Year. All of y’all follow the Love, Teach blog, right? Be sure to join in the high-five padlet!! Becca coming to the rescue after NBC made it difficult for me to find a much-needed gif! PUPDATE: My Wall of Cute images were located and then scanned for posterity by Mr Craig. And I think that is the perfect image to end this post on! Bound forth and be the joyous stars that you are!! I’ve been having frustration recently about how much I share online. I’ve taken so much from the MTBoS that I want to give back in my little way; I don’t have Big Ideas like 3 Acts or WODB or Life Changing Theories of Teaching, but dammit if I don’t have a note taker maker for almost any topic you can think of. I’ve put a lot of time into creating all of my materials and it is nice knowing that my work is appreciated by some. You see, I’ve been trying to grow a pollinator garden to attract bees, butterflies, and hummingbirds. We first had a batch of Japanese beetles I had to deal with. Then a herd of deer came through and destroyed half the plants. Then we had a bit more wasps than usual. Then I got stung by a yellow jacket. At that point I told Mr Craig that I was pretty close to being done with nature and tearing all the plants out. So yes, there’s a few bad guys out there, but so are some butterflies. And big (nice) bees. We’ve even been getting hummingbirds recently. And, oh yeah, even some pretty flowers that I get to enjoy just because they’re pretty! So I could worry about the “bad” pollinators and the possibility of being stung or I could focus on how I’m giving bees and butterflies that are working hard a place to come to get extra energy that will help them build up their hives. No, you can’t pick your pollinators. But you can focus on the beautiful and beneficial ones. And squash the stinging ones under the heel of your shoe. I should finally admit it: I’m addicted to podcasts. Last year, when I was doing my 500 miles challenge, I would only allow myself to listen to them as I was walking or running. But now that I’m mostly doing workout videos, I allow myself to listen to podcasts at any time and now I can’t stop. I basically listen to three podcast brands (networks?) so here they are with my favorite podcasts and episodes. Disney Princess Death Match: Who will be selected as the best Princess? Anyone that grew up watching Disney will enjoy these. Favorite episodes include Mulan, Belle, and Merida. Story and Star Wars: It may even make you not hate the prequels! Obviously you should listen to whole series. The Light Bulb (sadly discontinued): This was by far my favorite of theirs, just a pop culture conversation each week. Favorite episodes were We Know Her Value, Technically Correct, and SGU, We’ll Never Be Done. StoryWonk Sessions (sadly discontinued): All the Pixar films! Fun times! They’ve also just started a Marvel discussion podcast and will soon be restarting their Dear Mr Potter podcast with book 2! StartUp Three seasons about starting a startup. First season is the best, along with any other Gimlet updates. Surprisingly Awesome is surprisingly uneven, but the Frequent Flyer Miles episode is a classic, and just waiting for someone to make a lesson plan around it. Some other good ones were Tubthumping, Concrete, and Mold. Mystery Show I want a Starlee Kine in my life. Seriously, the mystery is WHERE IS THE SECOND SEASON? There’s only six, so go ahead and listen to all of them, but my favorites are Britney, Belt Buckle, and Source Code. Try one of them out while you’re setting up classroom, commuting, or talking walk and let me know if you liked ’em! And be sure to comment or tweet me your faves as well! But it’s only 8 episodes each so going to finish it! About the same level of enjoyment I got from Downton Abbey, with 100% less crying from Mrs Bates. As a fellow teacher, you may have the problem of seeing the first 20 minutes of an episode and then falling asleep. So the highest praise I can give is to say that I have never fallen asleep during a Midwife episode! And unlike Downton, every character on here makes me want to be a better person. If the 1950s is too far back for you, how about the 1980s? 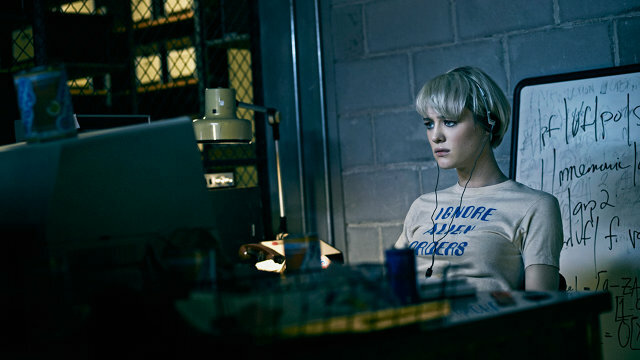 Halt and Catch Fire (netflix) had an odd, yet riveting, first season. But the second season I could not stop watching! Computers, start ups, the piemaker…what more could you want? So 1980s is too recent? Well, how about the early 1800s? Mr Craig just brought Horatio Hornblower to our beach vacation and I was reminded how engaging, fast-paced, and fun that show is! Even my mom liked it, and she does not usually like historical or war stuff! My dad was ready to stay up til 1 the night before we left to finish the cliffhanger. The only issue is that it is not available streaming. But the good news is Target has all 8 episodes (it was a miniseries, so each episode is 100 minutes long!) for less than 20 bucks! Of course I can’t let a recommendation post go by without mentioning Friday Night Lights, but it’s more of a formality since I’m sure you’re already watched this, RIGHT?!?! Ok, one last one! If you want a quick comedy series that will remind you of all you have to look forward to in the workplace…try Better Off Ted. (netflix) The fact that it only lasted two seasons is a travesty!! I couldn’t limit myself to just one gif, so here are three to end the post! What are some of your favorite shows to spend the summer watching?